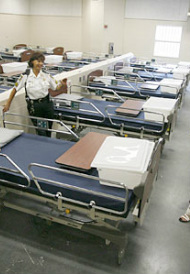 The following are real examples of experiences encountered by prison nurses. They reflect the complex challenges encountered when working in a prison environment. Please read the scenarios below and reflect on how you would feel and react if you were the correctional nurse in this situation. What would you do? 15 minutes pass and the other officers have seemed to calm down the prisoners yet the security guard is still not letting you pass into the courtyard. By now the prisoner is suffering from excruciating pain and has lost a significant amount of blood. What would you do? A nurse who has worked in a prison for 33 years says she often has to put herself “on parole” and take time away because the stress of the job gets to be too much. She states, "It is not all bad, you get to see everything here like drug abuse, domestic violence. It’s the place where we have the opportunity to correct these problems." Do you believe that nurses in prisons really have the power to correct these problems when their access is so restricted and there are laws that place custody before care in prisons? cell in order to treat them (Stamler & Yiu, 2012). - Nurses are often the first healthcare professional to assess and care for inmate suffering from infectious disease (Stamler & Yiu, 2012). - There are a variety of opportunities to develop nurse-led services for offender practicing nurses such as smoking cessation, healthy lifestyle, sexual health, cardiovascular disease and diabetes, just to name a few (Bennett et all, 2010). 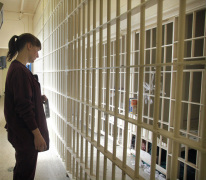 - Nurses working in correctional facilities receive a lot of professional autonomy, however, with autonomy comes a lot of independent work which is a concern for causing professional isolation and burnout (Stamler & Yiu, 2012). - The behaviour described in these cases would be considered negligent and unacceptable in a traditional nursing role. - Where is the line between punishing for prisoners past crimes and committing new crimes by denying care, and inflicting harm? - The nurse’s safety must also be considered in each of these cases. - Nurses can and do make a difference even with limited access.